Today’s post comes from a far colder climate. I’m sat at my parent’s house in Reading and it’s pretty damn chilly far as I’m concerned. I’m not feeling too bad for hours of flying though I do have massive cankles once more. Just hoping that the swelling will have all gone in time for my next race, it’s only round the corner. 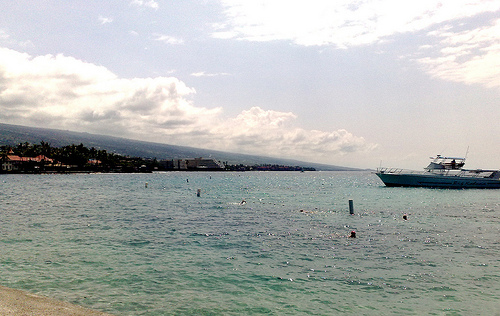 After all the excitement of the race I had a couple of days left in Kona. Time to chill out, relax and most importantly recover. Also as this blog will reveal time to compensate for months of denying myself sugars in a mass binge! I’m now more of the opinion it’s important to relax things a little after my races. I know I can get back on track quickly and mentally it’s good. It’s rare that I sleep well after a big race. My legs are usually just a bit too stiff to comfortably lie in bed. This time I woke at about 3:30 in the morning and was absolutely starving. A midnight feast followed as I raided the fridge along with the remains of the pack of bagels. Once the hunger was gone I managed a couple more hours before I gave in and accepted I was up for the day. After further essential snacking I headed down to the pier at around 7am and went for a swim with Steven and Jo. Swim seems a bit of a grand term for the 15 minutes of splashing about I did, but it’s the thought that counts. With arms feeling better than legs it wasn’t too bad just not fast. Far more important than the swim was the buffet breakfast that followed. After the previous weekends two and a half plate meat fiesta I paced myself a little bit better. Mixing in carbs in the form of pancakes along with a lot of meat added a bit of variety too. I did my best to ensure I got my money’s worth at least. Everyone’s plans largely revolved around relaxing as much as possible. That said Steven, Jo and I headed up Ali’i Drive on our bikes for a spin. It took most of the length of the Drive to actually feel OK and none of us were willing to go up the short, sharp climb at the end of it. We returned quite quickly, not sure if that was a tailwind or the draw of coffee and cake at Lava Java. If you ever want to overdose on sugar I recommend the Tear Cake. It’s massive and coated in toffee and icing. Delicious and possibly enough to fuel an entire Ironman. The evening brought race events to a close with the Awards Ceremony. As with the Opening Banquet food was pretty good, though I mainly focussed on the cakes this time. I think the caterers were expecting this as they seemed far better stocked than at the opening. I worked hard to ensure I’d taken in a months worth of sugar by the end of Sunday. The ceremony itself wasn’t too bad. With so many age group awards it can drag a little, but none of the speeches went on too long. As it finished the skies open and rain poured down. Those who’d been here the year before could now smugly break out their rain jackets. The rest of us got wet! We headed down to Lu Lu’s for a while, but by the time it was livening up I felt too tired to do a thing. Another night of poor sleep led into Monday. At least this time I didn’t need to eat a meal to get through the night! Swimming started my day with another solid 15 minutes of effort! Then it was breakfast at Splasher’s. At this point my aim for the day was to return to Paleo so my usual Meat Lover’s omelette was ordered. We followed a long breakfast with a long coffee. It was the next coffee break at Lava Java where my Paleo intentions collapsed. I could try to blame Steven for offering to get me a cookie, but the speed with which I accepted makes it nobodies fault but my own! It was delicious I’ll give it that. I made the decision to worry about the diet once I’d got home and relaxed a little. Most of my weight gain is fluid anyway. An early dinner and a stop off for ice cream was followed by goodbyes to many of my Kona companions. People were either heading home or to other islands. I was definitely a little jealous of the latter group! I had a quiet evening of bike and kit packing ready for my own trip the next day. What a lazy final day Tuesday was. I didn’t swim and I didn’t make a pretence of being on a good diet. Sure I still had the meat lover’s omelette, but I added a side of French Toast. Splasher’s French Toast is delicious and I’m pleased I could tempt Rachel and her boyfriend John into having some too. It’s better to be bad in company! A morning of shopping for my nieces followed. I spaced it out by consuming chocolate coated macadamia nuts, delicious! Lunch consisted of two, yes two, incredibly dense Lava Java muffins. Not quite the sugar bomb that the Tear Cake was but filling in their own right. Highly recommended to try if you’re out here. After race day of course! Sadly all the remained was to head for the airport and home. I’ve grown to like Kona a lot. Sure there’s not masses to do right there in town. I love the climate and pace of life though. Chilling at coffee houses is my thing after all. It’s not the most varied training venue on the other hand so once you’re back to real life and not race week it might be tougher. It was a fantastic trip and experience. I had a great result off the back of it too. I’m not sure it’s really sunk in yet. Really enjoyed spending my days training and relaxing with so many friends. I know I have to go back again next year!